A strategic plan tells a story. It is the story of where an organization plans to go over the next year or two, how it plans to get there and how it will know it has arrived. It is a bit like a travelogue with an element of mystery thrown in. Strategic Planning is a process not an event. The writing of a Strategic Plan takes place over time. It is not a one time event. Organizations often find the process of developing a Strategic Plan to be as beneficial as the plan itself. It is important to remember that along with a Strategic Plan an organization must have an implementation plan. A Strategic Plan that cannot be implemented is a useless plan. Prudential Bank made the decision to grow their personal trust portfolio and expand their personal trust product base. The President of the Bank determined that a Strategic Plan was needed in order to achieve the desired results. I managed a team comprised of the Chief Trust Officer, Sales Manager, Marketing Manager, the Bank President and others as required to develop an effective Strategic Plan. The Strategic Plan was presented by the Bank President to the Bank Board of Directors as well as executives of Prudential Financial. In addition to writing the Strategic Plan I developed an effective implementation plan. Are you ready to get started on developing your Strategic Plan? An initial consultation is only $100. Here is what you get. 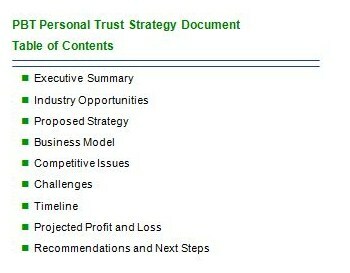 The $100 fee is applied to the cost of developing your Strategic Plan if you use Jackie Willey. Jackie Willey is available for a free 30 minute consultation to discuss your Strategic Plan and help you develop the best strategy to meet your needs.